BEREA, Ohio The Browns are changing again. One day after ending yet another dismal season with a loss in Pittsburgh, Cleveland fired coach Pat Shurmur and general manager Tom Heckert, the first moves in what is expected to be a massive offseason overhaul by new owner Jimmy Haslam. Shurmur went 9-23 in his two seasons with the Browns, who will embark on yet another offseason of change  the only constant in more than a decade of futility. Cleveland has lost at least 11 games in each of the past five seasons and made the playoffs just once since returning to the NFL as an expansion team in 1999. The Browns just can't seem to get it right. The firings of Shurmur and Heckert signal the start of a renovation by Haslam and CEO Joe Banner, who will immediately begin looking for replacements. "We felt that these moves were in the best interests of the Cleveland Browns and our future," Haslam said in a statement. "I enjoyed getting to know Tom and Pat over the past several months, and want to thank them, not just for their contributions to the Browns, but also the insight they were able to provide." Already, the list of possible coaches to take over for Shurmur includes some of college football's top names. Haslam may want to make a big splash and land either Alabama's Nick Saban or Oregon's Chip Kelly, who both still have bowl games ahead. Penn State's Bill O'Brien is also believed to be on the Browns' short list. There is also reported interest in several NFL assistants including Indianapolis' Bruce Arians, New England's Josh McDaniels, Denver's Mike McCoy, Washington's Kyle Shanahan and Cincinnati's Jay Gruden. Among the general manager candidates are: Atlanta player personnel director David Caldwell, San Francisco director of player personnel Tom Gamble, Baltimore assistant GM Eric DeCosta and NFL Network analyst and Mike Lombardi, who worked with Banner in Philadelphia and for the Browns when Bill Belichick was Cleveland's coach. Banner promised in a recent interview with The Associated Press not to put any limits on his search for a new coach. "It doesn't have to be a college coach," said Banner, who hired Andy Reid during his 19 seasons with the Eagles. "It doesn't have to be a pro coach. It doesn't have to be an offensive guy. It doesn't have to be a defensive guy. I'm more looking for qualities of a person consistent with the most successful coaches." 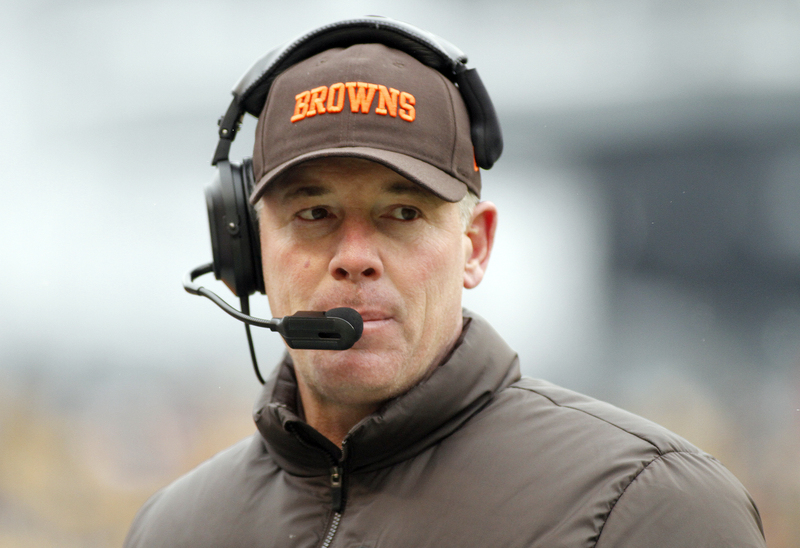 Shurmur's replacement will be the Browns' sixth coach since 1999. The Browns were competitive this season under Shurmur. They just didn't win enough. Cleveland was still in the playoff mix earlier this month, but a three-game losing streak to close the season  they were blown out by Washington and Denver in consecutive weeks  ended any chance of Shurmur saving his job. Shurmur, who was emotional when he addressed the Browns following Sunday's loss, leaves the team with some satisfaction. "I am extremely proud of the players on this team, who I felt made tremendous strides and helped to make the Cleveland Browns relevant again," Shurmur said in a release. "I want to thank them, as well as my entire coaching staff for making the past two years enjoyable. My coaches are outstanding teachers and even better men. They helped me lead these players through a unique time of transition. "This group of players will achieve success soon, and there will be a part of me that will feel very good when that happens." CBSSports.com's Will Brinson says Shurmur never really had a chance. "After president Mike Holmgren announced that he was stepping down, and new owner Jimmy Haslam brought in Joe Banner as the Browns' CEO, it became painfully obvious to anybody half-paying attention that Shurmur wasn't in the team's long-term plans," Brinson writes. It may not have mattered how Shurmur did this season because Haslam, a former minority owner with the Pittsburgh Steelers who built his fortune with Flying Pilot J travel centers, was intent on bringing in his own people. Banner's arrival forced out president Mike Holmgren, who hired both Shurmur and Heckert but left before the end of his third year with Cleveland. Shumrur, who has two years remaining on his contract, was dealt a difficult hand from the start. His first season with the Browns was complicated by the labor lockout, depriving him a chance to work with his players in the offseason or installing his offensive and defensive systems. He chose not to hire an offensive coordinator, holding down both positions in his first year, a decision he later said was a mistake. Shurmur made his share of mistakes. He had some game-management issues and his play calling was often questioned. However, the 47-year-old seemed to be getting better in his second season, and he deserves credit for developing one of the league's youngest teams. The Browns had 17 rookies and 26 players with two years or less of experience on their roster. Heckert, who came to Cleveland from Philadelphia, succeeded in upgrading the Browns' talent. He overhauled an aging team, infusing the Browns with solid young players through the draft. In April, he selected running back Trent Richardson, quarterback Brandon Weeden and offensive tackle Mitchell Schwartz, all of whom had solid first pro seasons. Heckert also gambled and nabbed wide receiver Josh Gordon in the supplemental draft, a choice that seemed risky but paid off as the 21-year-old blossomed. But it may have been a move Heckert couldn't pull off that doomed him. The Browns were beaten out by Washington in the sweepstakes to get prized rookie quarterback Robert Griffin III. Cleveland tried to package picks to swap with the Rams, who eventually made a blockbuster deal with the Redskins who then drafted RGIII with the second overall choice. Heckert, who was Holmgren's first hire with Cleveland, thought he would have five years to build the Browns but wound up getting just three. It's expected Heckert will quickly be scooped up as more than one dozen teams are expected to have front-office openings.